These cupcakes are exploding with Nutella flavor! Super moist and tender chocolate cupcakes filled with a Nutella lava sauce that erupts in your mouth as you bite, and topped the Nutella-iest frosting you’ll ever meet. The frosting does not have a speck of powdered sugar! 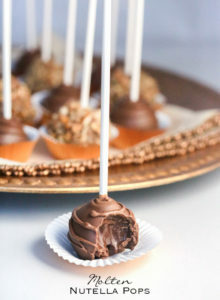 A topping of Ferrero Rocher rounds up the chocolate-hazelnut goodness. We’re still on a Nutella kick around here, in celebration of World Nutella Day coming on February 5th! If you’ve been following along my little over 2 1/2 months of blogging, you probably know how smitten I am of Nutella, and that it’s taking over the blog. If you’re new around these parts, please allow me to introduce you to myself. My name is Tasbih and I’m a Nutella addict. And here’s the proof: that, this, that, that and that. Nice to meet you. And I’m back again with yet another Nutella recipe! This time in a dreamy cupcake form with explosive powers! Don’t be fooled by its fancy-candy topped appearance and stripy golden liner. 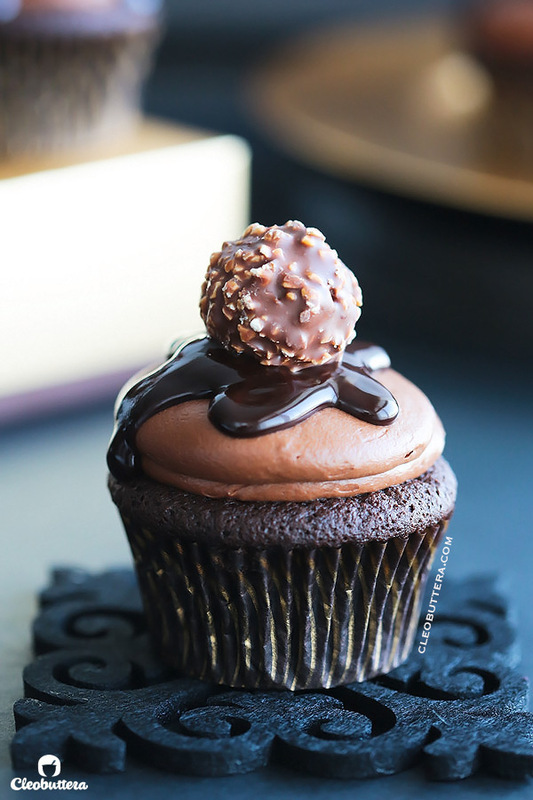 This cupcake will erupt lava in your mouth and hit you with bold Nutella notes in every bite. I’ve been bottling up this cupcake recipe for a looooong time. Way before I even thought about writing a blog. I tweaked and tweaked and played with it over the years, to produce that ‘hit-you-in-the-face’ Nutella flavor. And I’m now finally happy with it and ready to let it out. It’s one of those things that when people taste, I get remarks like “this is the best cupcake I’ve ever tasted!” and I keep get so many requests for the recipe. I made them several times for my kids’ bake-sale at school and they are always the first thing to sell out. Check the bake-sale ones here on Instagram. This is always followed be several emails from teachers praising them and asking for the recipe. So what makes these cupcakes so special or dare I say the Ultimate? 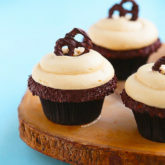 You know those cupcakes that call themselves “Nutella” cupcakes, but then when you taste them, you have to really concentrate and squint your eyes to be able to detect the faintest hint of Nutella? Yeeeeeeah…well those are the complete opposite of that. The Nutella Sauce Lava center and the Very Nutella Frosting. 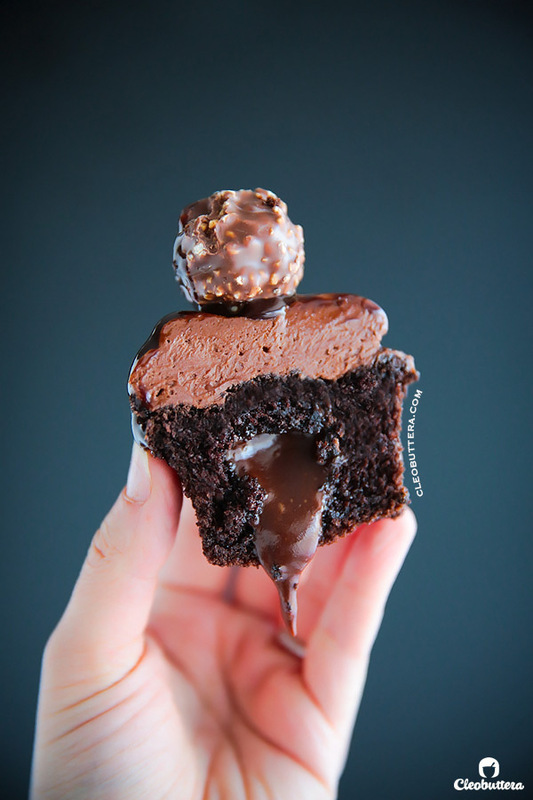 Nutella sauce is injected into the center of the cupcake, giving it that molten lava effect while also adding another dimension of Nutellanessness. Let’s just pretend that this is a real word. It’s just Nutella thinned down with a little milk to give it a saucy consistency that is not as heavy as if we had injected it with pure Nutella. ‘The Very Nutella Frosting’ is simply the Nutella-iest frosting you will meet. It is as Nutella flavored as it could get. So delicious! Typical Nutella frosting recipes use between 1/4 cup to 1/2 cup Nutella and piles of powdered sugar. In my humble Nutella-loving opinion, I think that just produces an overly sweet frosting with barely there Nutella flavor and a gritty texture. Here, the frosting does not even have a puff of powdered sugar and has a whopping 1 1/2 cups of Nutella!!! So you can be sure that it’s gonna be silky smooth and perfectly sweet. The sweetness and stability come instead from melted chocolate chips mixed right in. A little cream cheese in there gives an ever-so-slight tang and helps make the frosting not taste buttery. See that? I was really tempted to call it: Best Ever Nutella Frosting, but decided to leave it at Very Nutella Frosting and let you judge for yourself. As for the cupcakes themselves. They have been my go-to chocolate cupcake recipe for several years and for a good reason. They are so soft and tender, just chocolatey enough and of course moist, because we all hate dry cakes. They are fluffy, with a slight pleasant fudginess to it. I have yet to find a chocolate cupcake recipe that I like more than this. Except for another one which I also love, but it tastes like dark chocolate, so it’s not for everyone. The cupcake batter is very thin and soupy, so don’t be alarmed. I still like to use an ice cream scoop to portion them instead of pouring it, which gets really messy and uneven. When they bake, they will rise really high, then deflate slightly creating flat tops with a slight peak in the center. Let those babies cool completely before filling and frosting. While that is doing its thing, let’s make some beater-lickin’ good frosting. Then you’ll plop in your Nuuuuuuuutella and mix that in. Mmmmm. 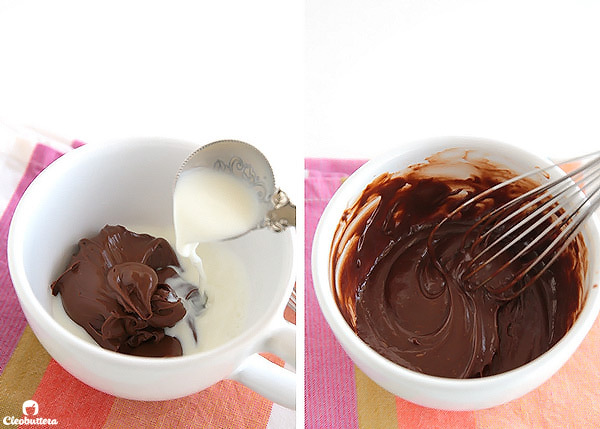 Pour in the melted chocolate and mix, mix, mix. Now try to resist eating it by the spoon. Just lick the beaters, will ya? At this point, if you feel that the frosting is on the soft side, cover and refrigerate it till you finish everything else. I sometimes need to do this on hot days, otherwise, it’s pretty stable. 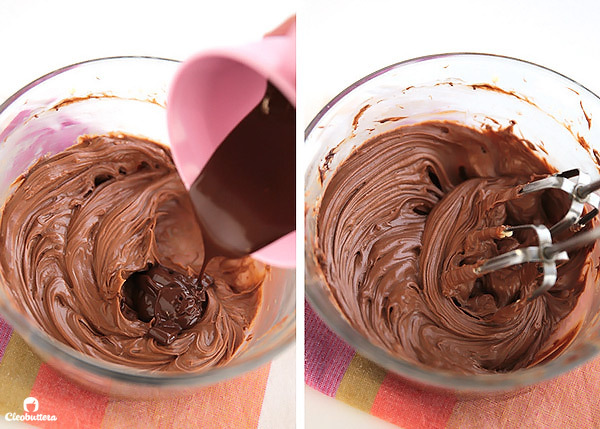 Time to make that oozy, molten-y, lava Nutella sauce. Put Nutella, pour milk, whisk, done! Now you’re ready to assemble. 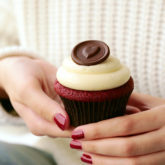 Use a pairing knife (or a small sharp one) cut a round circle in the center of the cupcake. About an inch in diameter. Use the tip of the knife to help you lift the circle, then remove with your finger. Cut the bottom fluffy half of this piece and eat it. A little treat for the cook; you’ve earned it:) Save the top half because we’re gonna use it later. Then using a pipping bag or a spoon, fill the hole with a generous amount of the Nutella sauce. Almost to the top. Then cover the hole with the saved piece of cake circle. Now grab that yummy frosting and pipe on to that cupcake. Check out on instagram a video of exactly how I do that. Then if you have any leftover sauce, drizzle that on top, or just use chocolate syrup. I used store-bought syrup here, because the little guys squirted all that was left in the pipping bag in the mouthes! You’ll most likely do the the same. Now top those babies with a fancy-schamancy Ferrero Rocher, sprinkles, chocolate curls, fondant cut-outs, potato chips, not even kidding, or whatever floats your boat. Cupcake recipe can be halved or doubled with great results. Please note that I developed the frosting recipe using a kitchen scale then converted it to volume, so please use a scale for maximum accuracy if available. The frosting makes enough to frost 20 to 22 cupcakes, yielding a 1:2 ratio of frosting to cupcake. If you don't like a lot of frosting, you can halve the recipe. Alternatively, if you like piles of frosting, you can make 1 1/2 to double the recipe, according to how much you like on there. 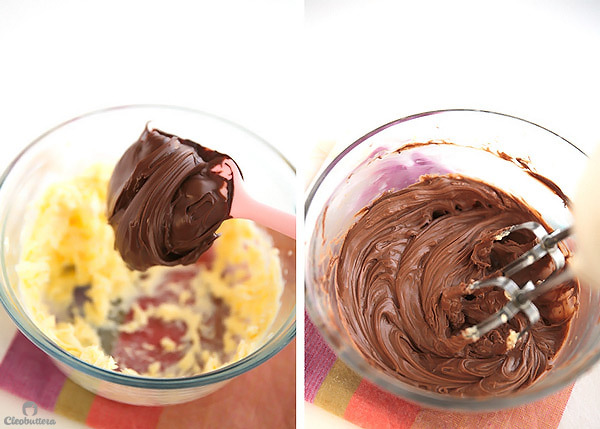 Make sure you have 1 (750g) jar of Nutella or 2 (350g) jars for this recipe. Adjust oven rack to middle position. Preheat oven to 350F/180F. Line 2 cupcake pans with 20 to 22 cupcake liners. 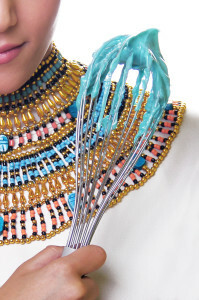 In the bowl of a stand mixer fitted with the whisk attachment (or in a large bowl, if using a handheld mixer), whisk the butter on high speed until smooth. Add the brown sugar and mix together until slightly lightened in color, about 3 minutes. Scrape down the bowl, then add the eggs, one at a time, mixing well after each addition. Add in the vanilla and continue mixing until lightened more in color and texture and looks fluffy, 3 to 5 minutes. Scrape down the bowl. Add the cocoa powder, baking soda, salt and mix until well blended. Scrape down the bowl. With the mixer on lowest speed, add one-third of the flour, followed by half of the sour cream, then mix to blend. Then add the second third of the flour, followed by the rest of the sour cream, mix again. End with the remaining flour and mix just until combined. Scrape the bowl as needed. With the mixer running on medium low speed, drizzle in the hot water (or coffee) and mix until very smooth, about 1 minute. Batter will be very thin and soupy. Portion the batter evenly among the cupcake liners (I like to use a 3 tablespoons measure ice cream scoop for a smaller cupcake) until 2/3 full, or (a 1/4 cup measure ice cream scoop for a larger cupcake) until 3/4 full. Bake until the tops spring back to the touch and a toothpick inserted into the center of the cupcake comes clean or with a few cooked crumbs attached, 16 to 17 minutes. Start checking after 15 minutes. The cupcakes might deflate slightly after they come out of the oven, but should NOT look sunken. If the do sink, that means they were underbaked. They should have slightly domed tops. Let cool in the pan for about 5 minutes or until cool enough to handle, then transfer to a wire rack to cool completely before filling and frosting. 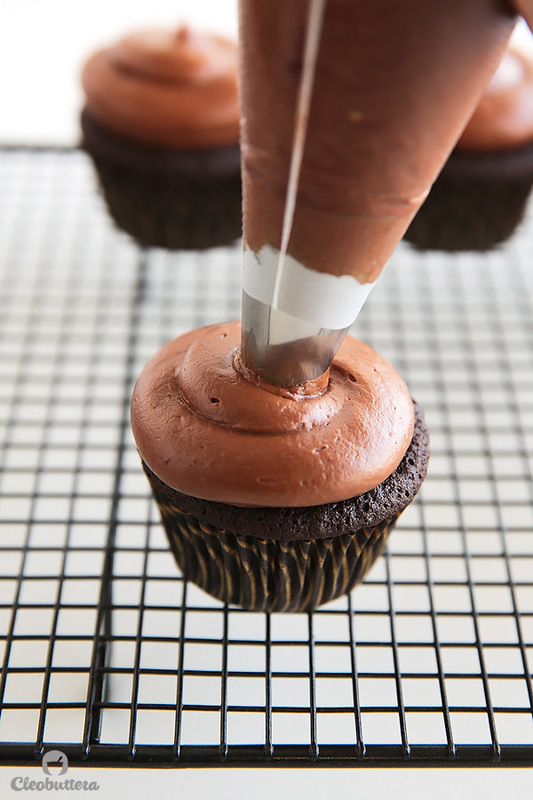 To make a hole in the cupcake, use a pairing knife to make a deep circular (1-inch in diameter) cut in the center of the cupcake. Make sure you only cut about halfway through the cupcake, and don't go all the way through the bottom. 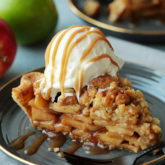 An apple corer would also work perfectly here. Using the tip of the knife, lift the cut piece of cake from deep inside and remove it completely. Let's call this the 'plug.' Cut the bottom half of the 'plug' and snack on it or do whatever you want with it. Set aside the top half of the plug, which will be used to cover the cupcake after filling them. 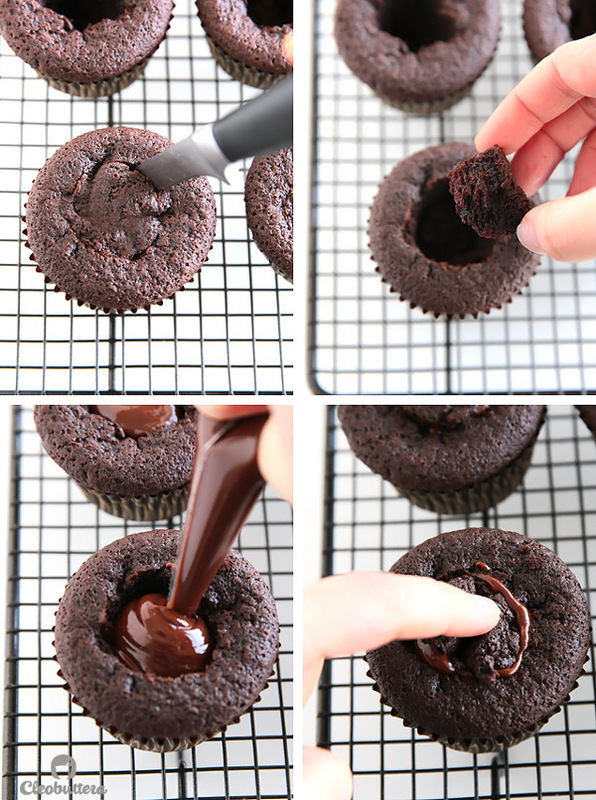 Using a small spoon or a piping bag or a zipper lock bag with the corner snipped off, pour in the Nutella sauce into each cupcake. Be generous:) Fill almost to the top. Use the cake 'plug' to cover the tops of the cupcakes, where they have been filled. Using your favorite piping tip (I used a large round tip Ateco 808) or an offset spatula to frost the cupcakes with the Very Nutella Frosting. The way it's done here, is by starting to pipe in the center, going aroung once, the ending in the center with a burst of pressure. If desired, drizzle with leftover Nutella Sauce, or chocolate syrup, then top with Ferrero Rocher, sprinkles or chocolate curls. In a medium microwavable bowl, place both types of chocolate chips and melt in the microwave, stopping every 20 second to stir the chocolate. Heat and stir until almost completely melted. 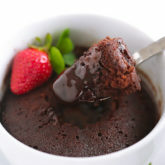 The warmth of the melted chocolate will melt whatever bits of chocolate left. Set aside to cool slightly. 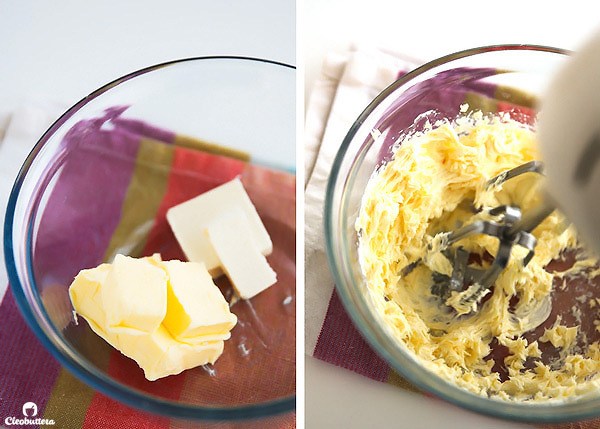 In another medium bowl, combine the butter and cream cheese and beat using an electric mixer until smooth and well blended. Add in the Nutella and mix until completely incorporated. Scrape down the bowl. Add in the melted chocolate and mix until everything is well combined, scraping the bowl as need. 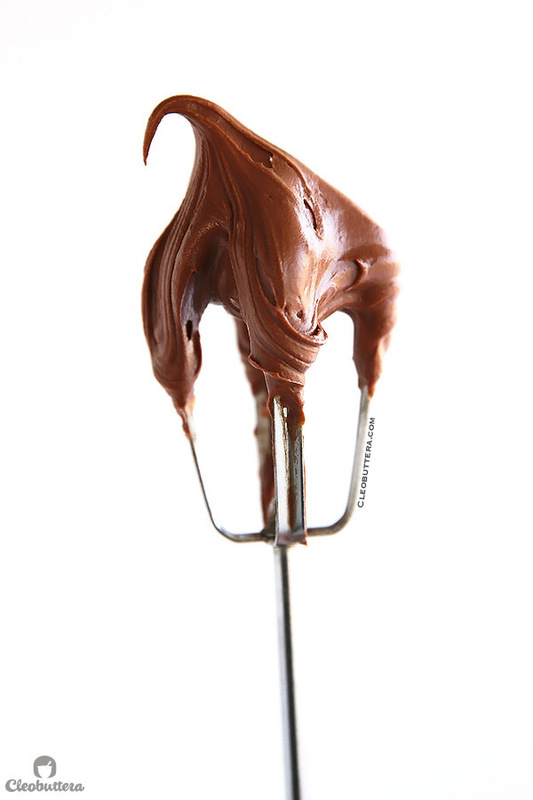 Combine the Nutella and milk in a medium bowl, whisk well until completely smooth. The cupcake batter will make anywhere between 16 and 17 cupcakes. Making 16 will result in a larger cupcake with a muffin-top-like cap. Making 17 on the other hand, will produce cupcakes that rise just right above the cupcake liner (just like the ones pictured above). Dutch processed cocoa powder gives a deeper, more chocolatey flavor to these cupcakes. However, if you can't find it, no worries, natural unsweetened cocoa works really well too, without affecting the outcome. If using natural cocoa, use the darkest, best quality cocoa you can find. I use Hintz unsweetened cocoa and love it! Cake flour gives these cupcakes a soft and tender crumb, but it could be hard to find, at least where I live. I substitute this by placing 3 tablespoons of cornstarch or cornflour in my measuring cup, then add the all-purpose flour on top of that and continue measuring like I normally would. So I end up using 1 1/2 cups minus 3 tablespoons of all-purpose flour plus 3 tablespoons cornstarch. If you have cake flour, just use that. 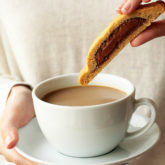 Using coffee in chocolate baked goods intensifies the chocolate flavor without making it taste like coffee. I just stir in 1 1/2 teaspoons of instant coffee (Nescafe) into my 3/4 cup of hot water. If you're not okay with using coffee then just use hot water instead. Hahaha Esraa you’re really so cute! I will never forget that you were from my very first supporters since day 1. I think you’re becoming my imaginary friend too. I’m really so humbled that you think I’m qualified enough to give classes. It’s definitely in the back of my head. You’ll surely be the first to know if I ever make it happen. Thank you so much for your love. 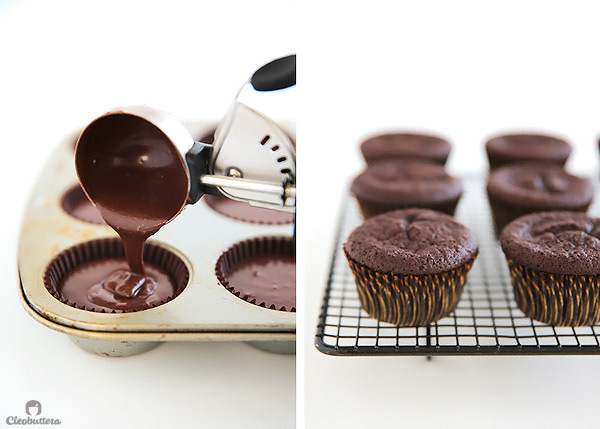 I am seriously just drooling here over the images of these nutella lava cupcakes! They look AMAZING and wickedly delicious. Pinned! I feel ya’ girl. I drool at anything ‘lava’ too. A million thanks for following along & thanks for the pin! Hi!! Loved this..every Nutellay bit of it…Meet me..ANother Nutella lover! 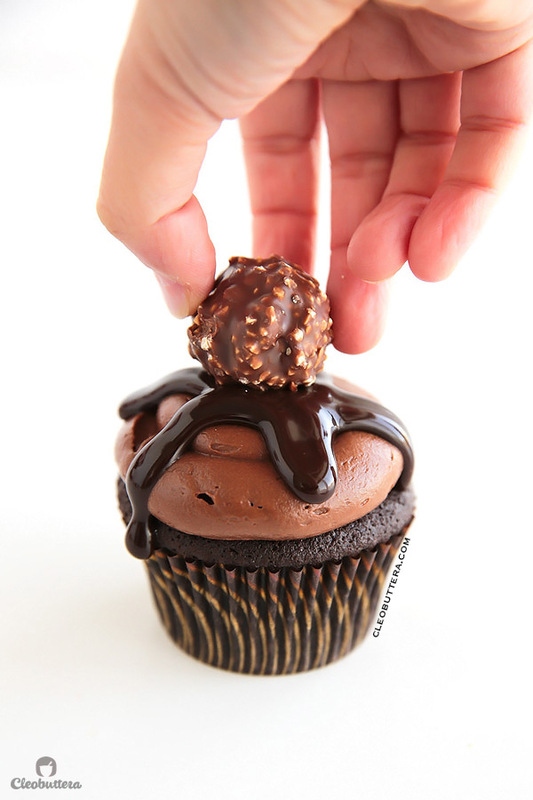 I did a choco cupcake with mile high frosting tooo… but I love the idea of the nutella lava!! Yummm …and was thinking Caramel Popcorn topping in place of Ferrero Rocher… What do you think? Will that work? Hi Swayam:) What a pleasure to meet another Nutella lover; my favorite kind of people. Gotta go check your cupcake! Sounds delicious. And that caramel popcorn toppers would insanely good here…that caramel-y crunch with the smoothness of the frosting and gooeniess of the lava would be the perfect combo. For the life of me I can’t figure out how you ended up with cupcakes to photograph. I would have licked up all that batter leaving me with nothing to show for it. My hubby is head over heals for Nutella. If he comes home to these, I surely will get the wife of the year award. Mmmm. Hahahaaa! You’re cracking me up here with your adorable comment. Wanna know how I ended with cupcakes to photograph? I’m on a diet! (sob, sob, sob!) To say that it was pure torture would be an understatement. But…gotta lose those recipe testing pounds. I hope your husband enjoys these to the extent of throwing you another wedding! I just love people who fall in love with food. We get each other:) Hope you give the frosting a go June! Delicious! I’m loving the lava part of these cupcakes. What a yummy devilish surprise! Devilish indeed. It’s my favorite part. These look amazing! Pinned. Beautiful pictures too. That frosting is dangerous. Dangerously good-looking, that is. Jeeze, girl! You’re a rockstar! Tell me about it. I’m scared to be left alone with it. Who’s the rockstar? Oh right, that’s you! Oh Anu! You always have the nicest things to say. Thank you so much. And sorry for the chocolate torture; I know how it feels. LOVING that shot with the Nutella filling oozing out! Drool. I took so much restraint not to put my mouth under it. Ha! Thanks so much. I’m so happy you like it. Oh my goodness, what a beauty! Look at that gooey inside, it’s decadence at its best! Pinned! Thanks for the pin Oana! Oh. My. Goodness. I’m a total Nutella addict. Nice to meet you 😉 I need these in my life for sure. Oh, and to say the photos are gorgeous is an understatement. Love the blog! What. The. Heck. Nice to meet YOU. Holy cow these look unreal. 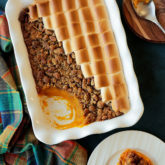 I love your photos and LOVE the recipe! Mmmmmm pinned! Nice to meet you to Erica. Thanks so much for the pin! As a fellow Nutella addict, I am 100% on board with these cupcakes. They look PHENOMENAL!!! These cupcakes are drop dead gorgeous! I’m in love! And I die over Nutella too – so good! I’m loving your whole blog – beautiful stuff! You’ll find the recipe for the cupcakes in the blueish box right underneath the photo where I’m placing the ferrero rocher on top of the cupcake. It should say: “for the cupcakes.” Its right on top of the frosting recipe. I cant really imagine I did not discover you earlier!! Mashallah you are talented and yes as the 1st comment said you really have to offer classes one day and I will do my best to be there inshallah. oh my gawd, these cupcakes are amazing!!! I’m totally late to the party but wow, what a way to celebrate World Nutella Day! these are gorgeous! You’re never too late when it comes to Nutella! I celebrate all year long:))) Thanks Alice! I’m so happy you like these. Oh my goodness, I just came across your page this morning. These are GORGEOUS! And I’m sure they taste even better! Love it. Thank you so much Andrea. Wish I could get you to taste this. YUM! So happy you stopped by. Hi Tasbih, I’ve featured these cupcakes on my blog, hoping that you don’t mind, but if you do, please contact me and I’ll remove it. All the best. can these be made in advance? As in, if i do the batter one night, but baket it the next night? Or should it be baked rigth away? Same question regarding the batter and filling! Thank you! these look amazing. You won me over with the nutella theraphy cookies, they turned out amazing! Hi Valeria:) Perfect question on the perfect timing! I actually just made these yesterday to be devoured today at my son’s bake sale at school. He told me they sold out and people loved them! I have also made these several times in advance in two different ways and they both work perfectly. Just pick whichever works best for you. One way is to bake, fill, and frost them completely, then store them in an airtight container (like Tupperware) overnight. The next morning, I’d take them out of the fridge as soon as I wake up to give them enough time to soften back up and go back to room temperature. One thing I love about this cake is that it doesn’t dry out with refrigeration and the lava filling does not soak in, so no worries about them drying out or getting soggy. This is perfect for if you don’t have time the next day to assemble. The other option is to bake the cupcakes, let them cool then store them in an airtight container at room temperature (do not refrigerate). Make the frosting and filling, transfer to separate bowls, cover really really well with plastic wrap, then store in the refrigerator. 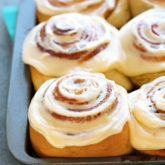 The next morning, take the frosting and filling out of the fridge, let them come to room temperature, then fill and frost. I do this method a lot. I haven’t tried preparing the cake batter in advance then baking it the next day, so I can’t tell for sure if it’s gonna work. One thing I’ve noticed though, is that when I leave the cupcake batter to rest for 20 minutes after being scooped into the cupcake pan, they rise higher and tend to be fluffier. I will actually add that to the instructions. Hope this helps and I hope the cupcakes turn out fantastic! Your most welcome. Hope you give them a try! Hi Tasbih Thankyou very much for sharing your recipe with us. I live in the UK and I was just wondering if you were able to give me the measurements in grams? The reason I ask is I have various cake books where they give measurements in cups which are not the same, I was slightly confused during the baking process, but as they have just came out the oven im hoping they are as delicious as my kitchen smells!! I really hope these turned out a major HIT! As I’m really not used to measuring in grams, I wrote the amounts of both the frosting & sauce recipes in ounces as well as in cups. Converting ounces to grams could easily be done using any online converter. 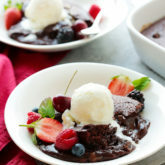 However, because I did not develop the chocolate cake portion myself, but adapted it from Food Network, I only have it in cups, since this is what the website gave it in. I tried to look for a conversion on their website but sadly couldn’t find any. I will surely keep metric measurements in mind and try my best to include them in future recipes. Meanwhile , I’ll link you up to a reliable baking conversion chart which I’m confident will help. So happy to hear that Jaynie:)) They are really my favorite chocolate cupcake of any kind. I just made them again a few days ago, but this time I added baking powder along with the baking soda that’s already there because I wanted an even fluffier cupcake with a higher rise & wow! What a difference that made. I recommend you trying it out if you prefer less fudgy cakes with a fluffier crumb. Whisk 1 1/2 tsp baking powder into the flour. Are you recommending adding baking powder on top of baking soda, or just substitute baking powder with baking soda? Please advise. Personally, I love the results of using both baking powder & baking soda together; makes them extra fluffy. However, this combo didn’t prove very successful for several readers and caused volcanic eruptions in the cupcakes. It could be due to using different types of cocoa powder or other variables. For that reason, I’ve omitted the baking powder & kept just the baking soda. This seems to yield the most consistent results for everyone. So to be on the safe side, I recommend using baking soda only, at least for your first trial. Then if you want, you could experiment with adding baking powder to see if I works for you. These are the most amazing cupcakes I have ever tasted. 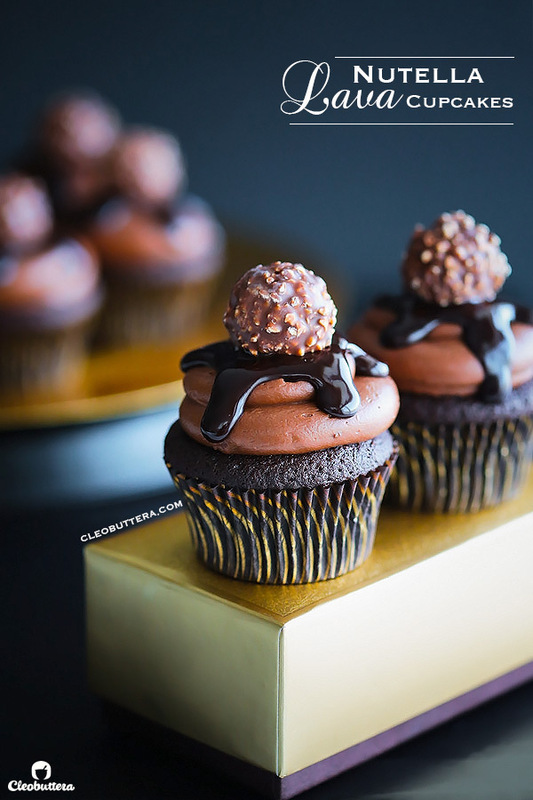 I have been searching for a good Nutella Cupcake recipe (as I absolutely LOVE Nutella) that isn’t too sweet and these just blew my mind! I made a batch the other day and took them to the office and everyone loved them. Not only is it the best Nutella frosting, but the chocolate cupcakes are so moist and delicious! Thank you so much for sharing. Reallly want to try this but i’m not a fan of butter-cream/cream-cheese frosting, do you think the nutella taste covers the butteriness and tanginess of the frosting ? Another question, I know it says it makes about 3 1/2 cups of frosting, will there be leftovers ? There’s an ever so slight tang from the cream cheese but overall it does not taste like cream cheese frosting at all; if you didn’t know it’s in there, you wouldn’t taste it. I think it’s essential so the frosting doesn’t taste too buttery but feel free to substitute the cream cheese with equal amounts of butter. If tasted alone, the frosting does taste somewhat buttery but the Nutella does help cover it up. When paired with the cupcakes & Nutella sauce, you shouldn’t taste the butteriness because of the overall experience, especially if you don’t use a lot of frosting. As for the amount of frosting, it really depends on how much you put on there. 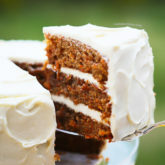 If you use the same amount as I do in the pictures, then you won’t have leftover, if you just like a little smear of frosting, then I recommend halving the amount. Please refer to notes above the ingredients list. oops sorry didn’t see that. Thanks! Can I make frosting night before and leave in fridge so it’s ready to go next morning. 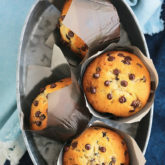 Or will melted choc chips set? Also; loving this! I tried them last week and loved them. My daughter especially. So wanting to make for a birthday party. I’m so happy you guys like the cupcakes! They are a HUGE hit at our house too. You sure can make the frosting the night before; I’ve actually done it several times. Just store in an airtight container or covered bowl and refrigerate. The frosting will of course harden in the fridge as it chills, so just take it out about an hour or two before you plan to use it so it comes back to room temperature. Once back to it soft state, give it a few stirs with a spatula and you’re all set to go. Hey Tasbih, I want to make these for Eid. Unfortunately where I live, sour cream isn’t readily available. Do you think I will be able to use buttermilk instead? P.S. I made crescent rolls and OMG they were outstanding! Hey Fariha:) I wouldn’t recommend substituting buttermilk here as it’s too lean for this recipe and will probably yield drier cupcakes. Greek yogurt would make a good substitute or you could make your own sour cream which is even better. I remember there was a time when Egypt was running low on sour cream for some reason, while most of my favorite recipes call for it. So I googled homemade sour cream and found so many tutorials and it’s so incredibly easy to make, but you need to plan a head though as it requires some time to stand. You just stir together heavy cream with some buttermilk in a jar and leave it at room temperature for about 24 hours…I think. It magically thickens and turns into some of the most amazing sour cream. You could find lots of videos on You Tube on how to make it. Thank you so much Tasbih for responding back. I will definitely make my own sour cream and report back to you on how these turned out after Eid! Hey Tasbih , hope you had a magnificent Eid! I made these cupcakes on Eid….and all I have to say is….wow! They are ridiculously good! Everybody loved them. With my two year old wailing a lot, it took me longer to make them but they were worth every effort. Thank You! Yep! Thank you. Hi Fariha! My Eid was awesome, hope yours was as well:) I’m thrilled to hear that you guys loved these cupcakes. Thank you for letting me know how they turned out; makes me so happy. Howbto make the frosting more stiff? I tried this earlier afternoon but the frosting lil bit runnier and i dont like to add icing sugar into the frosting. Any suggestion? Btw the result was amazing my hubs really enjoy eating it. Its a perfect scored! I’m thrilled that you liked them Dina! Sounds like either your kitchen was too warm or your butter was too soft or the melted chocolate was too hot when you poured it in. First, make sure that the butter is at cool room temperature; so its pliable but not squishy soft. Also try adding the cream cheese cold from the fridge. Second, make sure that you allow the melted chocolate enough time to cool before adding it in, as if its too warm, it could melt the butter and soften the frosting. When I’m making this on hot days, I like to place the frosting in the fridge for about an hour before using it. This does the trick to stiffen it. Keep in mind that the frosting has melted chocolate in it and the chocolate needs time to set. If that wasn’t the case and your kitchen, butter and chocolate were cool enough, then I’d suggest you increase the amount of the melted chocolate. 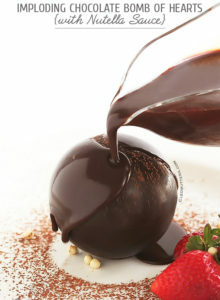 As the melted chocolate sets, it give the frosting stability, so by adding more, it will stiffen it even more. The flavor of the Nutella will not be as strong though, as the flavor of the chocolate will take over a bit, still good though. I’d add 1/2 an ounce of each kind of chocolate chips. They have a molten Nutella center the best Nutella frosting you’ve ever tasted. Romeo this is just so great to hear! I’m so happy you liked the frosting. It’s my favorite too because it’s packed with Nutella flavor without being too sweet. Hi Tasbih! 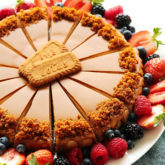 I love your website and beautiful pictures (that always make me hungry). So far I have made three of your recipes: Favorite Chocolate Chip Cookies, Incredible Carrot Cake with Cream Cheese Frosting (Best and Most Stable Cream Cheese Frosting ever) and the Nutella Lava Cupcakes. They were all amazing and delicious, but these Nutella Lava Cupcakes have made me a rock star in my neighborhood and are a favorite in my house. I couldn’t believe how good they were, like better than at fancy bakeries in NYC (and I have eaten a lot of cupcakes in my life). Thank you soooo much for posting it, you are genius! The chocolate cupcakes are amazing just by themselves and even more decadent with the Nutella Frosting and lava fudge interior. These are now my go-to chocolate cupcakes for everything. Checking your website is now on my daily to-do-list and cannot wait for more recipes!! Thank you! Blanca you’re comment has made me so happy that I had to read it out loud to my husband 🙂 Nothing makes my day more than to get such amazing feedback from awesome readers like yourself. Knowing that a recipe has worked for you, makes all the effort put into producing a post so much worthwhile, and gives me the much-needed fuel to create more. I’m extremely glad that you’ve liked all the recipes that you’ve tried from here, but just like you, I tend to be bias towards these cupcakes, because Nutella conquers all right? 😀 Also it’s one of the first recipes that I developed all on my own, so it’s like my baby. I’m really honored to have you on board, and I really hope you enjoy all the recipes coming ahead. Hi I made the cupcakes but my batter wasn’t runny, n my cupcakes were too moist n were breaking wen I was scooping to fill them… I think I had issue wud sour cream, if I can’t find from store please tell me how to make it the exact amount and adding more Nutella in d frosting would be okay? In wat ratio ? Are you sure you measured everything accurately? Which might also explain the dryness you experienced. If the fats & liquids are not the right amount in comparison to the dry ingredients, the cupcakes will end up dry. Overbaking also tends to dry out baked good, so watch out for that. I highly recommend sticking to sour cream for best results, but if you absolutely can’t find it, then yogurt is a good substitution especially the Greek kind if you can find it. You could add more Nutella in the frosting if you like, but note that this will produce a runnier frosting that doesn’t pipe well. It will be very loose but you could still spread it on the cupcake instead of piping it. Just keep adding Nutella in the end until you reach the desired flavor. You are adorable! I love the way you write – so fun! so bff hanging in the kitchen together! – and the recipes. Zomg, so amazing. Thanks for being a bright spark on the internet. Hello, I baked the cupcakes a few days back , my batter wasn’t very runny like u had mentioned and wen I baked them n started filling them once cooled they were breaking up. I made sour cream at home, was that a problem? please help how to make proper sour cream ? Hello Mariam 🙂 Nice to hear from you again. Please refer back to my answer to your previous comment above as I address most of your concerns. As for making homemade sour cream, I tried that a couple of times before & the results were good so I don’t think that was the problem. I find that homemade sour cream is looser in texture than store-bought though. The way I made sour cream is by combining 1 cup heavy cream with 1/4 cup buttermilk in a jar. Poke a few holes in the jar’s lid & leave it at room temperature for 1 to 2 days. The more you leave it out the more it will thicken. Thank you for the help!!! You are truly an inspiration and I’m a fan of ur baking skills…. 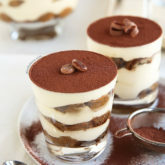 They are the moistest most satisfying and fun to eat dessert I have EVER had and I’m making them on two occasions: My birthday and Christmas!!!! Have the happiest birthday & enjoy the holidays to the max! These are going to be my new go to for cupcakes. And the frosting is going on everything although mine was much darker than yours. I guess I’ll have to make it again. Thanks for the great recipe!! I’m baking this right now! AIngredient list doesn’t have baking powder but instructions call for it… How much? Hi Adria😊 The ingredients used to have baking powder but I omitted it since several readers have commented that it made the cupcakes overflow in volcanic eruptions 😁 I think it might have to do with different types of cocoa used by different people that caused this. Using just baking soda proved to have worked consistently with everyone. I just forgot to delete it from the instructions. My bad. Yummy! Your description sounds amazing; you’re making me hungry😋 It’s so great to hear that you liked the center sauce & frosting recipes! I’m so happy your cupcakes were a hit! Oh gosh so sorry. Just saw this now. There’s NO baking powder. The recipe used to include baking powder at one point, but I omitted it because it caused some problems for some people, like causing the batter to overflow too much. I forgot to delete it from the instructions though. I’ll fix that now. Thanks for pointing it out and I apologize for the confusion. Hello Safia! I hope my reply isn’t too late as I’m currently in Canada and there’s quite a bit of time difference between us. If you don’t want to go through this process, then I’d recommend using my other favorite chocolate cupcake base for this sauce and frosting. It’s really really good and doesn’t require sour cream. OMG OMG OMG….. I love these to the moon and back ten times over. I made these two weekends in a row and I think my boyfriend may have proposed. Lolol. I am now a hit amongst his friends and they now call me the cupcake girl. Thank you for sharing your recipe and making me feel like a culinary Goddess! I am now a dedicated follower. Oh my God! This is the best news ever and I’m so touched that you came back to update me. You’re the sweetest and your fiancé is a lucky man. Congrats Vonnie…these cupcakes are honored to be part of this happy occasion. Oh yum! We made these yesterday (I say we, but really my son just waited for me to cut of the tips of the cupcakes so that he could pop them in his mouth). We used Greek yogurt- things came out amazing. Also, I may have been a bit stingy on the “lava” as I had quite a bit left, but no worries… we’re making pancakes this morning and I have a feeling no one will be very sorry. Thanks for the recipe. So great to hear that you loved them Christine! And you what? The Nutella sauce is my kids favorite pancake topping! Made these this weekend for my nutella loving friends birthday. I usually bake with measuring cups but this time I used my scales. They turned out perfectly! I used your cake flour substitute and they all rose perfectly and evenly. The most moist cupcake/cake I have ever made! So nutellary and delicious! Went down a treat! Can’t wait to try more of your recipes! 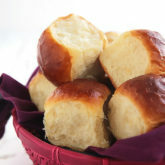 Im baking these again tomorrow for work – i want everyone to taste them! Thank you got sharing! That’s so amazing to hear! I’m so happy everything turned out so good & won some Nutella-y points. So kind of you to want to share the taste with everyone…they’re lucky to have you! Wow I’m happy they were such a hit! About the price…hmmmm…it really depends on the price of Nutella in your country, because its loaded with it. In Egypt where I live, Nutella is so expensive. If you used this recipe for a cake, would it make an 8″ 1 or 2 layer? Gonna be making this for daughters twin baby shower, but hoping to use this for granddaughter’s wedding cake as well. Minus the lava, but using it for filling. 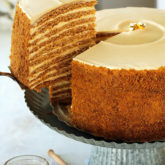 Just looked at the cake recipe, looks fantastic!! Now, since I am making cupcakes for my daughter’s twin shower, I was wondering about using that crisp layer at the bottom of the cupcakes. Ever try that? I’m gonna give it a go. The wedding cake layer is going to be a whopping 14″. The bottom. I’m gong to try for two cakes, each cut to make 2 layers so it will be 4 layers total. Any ideas will be appreciate it, am thinking I’d 3X the recipe. I’m glad you liked it! I’ve never tried using the crunchy layer in the bottom of cupcakes before because it’s meant to be no bake. I’m not sure how it will react if we put the batter on top of it & bake them together. I’d love to know if you experiment with that. Another option is to place the crunchy layer on top of the frosting instead of the Ferraro Rocher. You could roll them up in truffle-like balls or just randomly crumble them on top. As for the wedding cake, I must make it clear to you that this is a very soft and gooey cake. 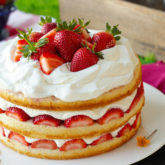 The sauce between the cake layers, make it super moist and sometimes slippery. So if you’re having the wedding outdoors on a hot summer day, then I wouldn’t recommend it, because you will need a sturdier cake. It will do perfectly fine in air conditioned indoors. With a cake that tall you have to make sure to secure the cakes’ structure with cake boards and dowels so the cake doesn’t collapse within itself. I recommend making a test cake ahead of time, to get a feel of its structure before proceeding with the super tall cake. I hope all goes well and you have a wonderful wedding with a cake that everyone goes bonkers for! Could you also suggest an eggless recipe for making the cupcakes? Some of my family members are allergic to eg, but I dont want them to miss out on this deliciousness! Thanks for the response! Will try it out. THESE ARE INCREDIBLE. Such a different recipe (brown sugar in cake?!) but boy, they turned out amazingly. These look and sound amazing – I’m think I’m going to make them for a leaving party for a lady at work. I was wondering if these are stil good once they are cold, as I will be making the the day before, is the centres still gooey or will it go hard? Hi Rebecca! I’m so excited you’re going to try these cupcakes; they’re my family’s favorite and always the first thing to disappear at bake sales. No worries here, the centers will still be nice and gooey the next day; it never hardens. Just be sure to bring the cupcakes to room temperature before serving. Thanks for sharing. Where do you get the cupcake liner? Hi Thomas! Glad you’re liking them. I got them from Golda’s Kitchen in Toronto, Canada. Hi! @cleobuttera. I am Dyra. I want a ask you something. Is overmixed will make the cupcake break up? And I try it and the cupcake broke up and I am worried about that. Can you answer this? Please…. Hi Dyra! Actually overmixing causes cupcakes and cakes to have a tough texture, but I don’t think it’s the reason for a broken/crumbly cupcake. 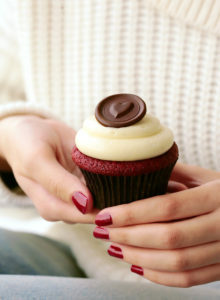 It is a very soft and tender cupcake, but not to the extent of falling apart to the touch. Is there anything that you perhaps did differently or substituted? I’d love to know so I could help you troubleshoot. My first foray with Nutella as a filling and a frosting. Awesome! Nutella is a sure-fire crowd pleaser. It’s my go-to “ingredient” whenever I want to make a dessert that is sure to please.